The Ben Nevis distillery lies in the shadow of one of Scotland’s highest mountains and carries the same name. Its whiskies often overlooked, its new make spirit often shipped to Japan to be bottled as overpriced Japanese whisky. 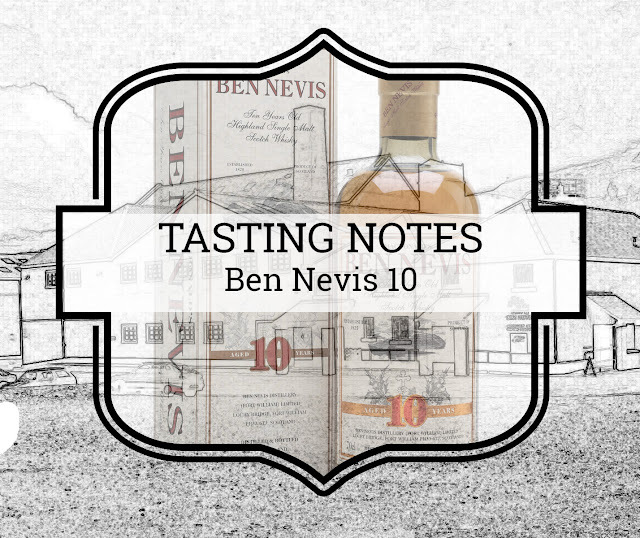 Ben Nevis produces blends and single malt whiskies. It is one the very few brands once producing a single blend since they had both pot stills and Coffey stills at the distillery. The pinnacle of this feat is a 40 year old “blended at birth” single blend in 2015. 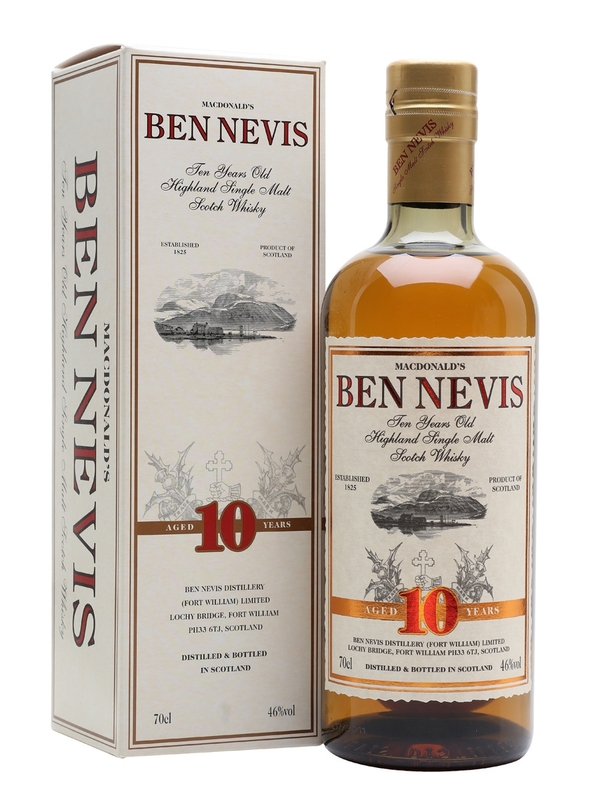 The 10-year-old single malt, first introduced in 1996, still looks like it was teleported from the 1960’s, even after its 2017 redesign. The contemporary bottle shape is a clear hint to its current owner, Nikka. Time to have a sniff and a sip of this new “old” single malt. Colour: Clear and shiny new gold. Swirling reveals thick slow legs. Adding water reveals a thick Scottish mist. No sign of chill filtration. Nose: A thick aromatic nose. Dirty Ardbeg-like sherry only with a minimal amount of smoke. A whiff of sweet rum mixed with ripe and juicy fruits. Pear, mango and grapes splashed with some Pedro Ximenez sherry. Juniper berries and cardamon. Orange peel, grape seeds and wood. Liquorice, heather and flowers. Quite a fair amount of pencil shavings. With water: Grape and mango juice. Fresh, sour with bitter aromas. Think of an apple orchard after a rain shower in spring. Taste: A light and playful mouth texture. Szechuan pepper and orange. Black coffee topped with caramel syrup. Pears and sweet pear juice. Ripe melons and a whiff of aniseed. Bitter malt and mango. With water: apple syrup, bitter malt and grape seeds. Finish: Pepper and orange offering a warm afterglow. Or maybe it is orange blossom water. A bitter finale with some bay leaves. This Ben Nevis 10 is a prime member of the “Class of 10”, a series of 10-year old single malts setting the standard for a lot of single malts. Whiskies that should be on every whisky drinker’s shelf. Everything about this whisky is old fashioned. The packaging - updated in 2017 - still looks like it was teleported from the sixties and the flavours are of an equal quality. 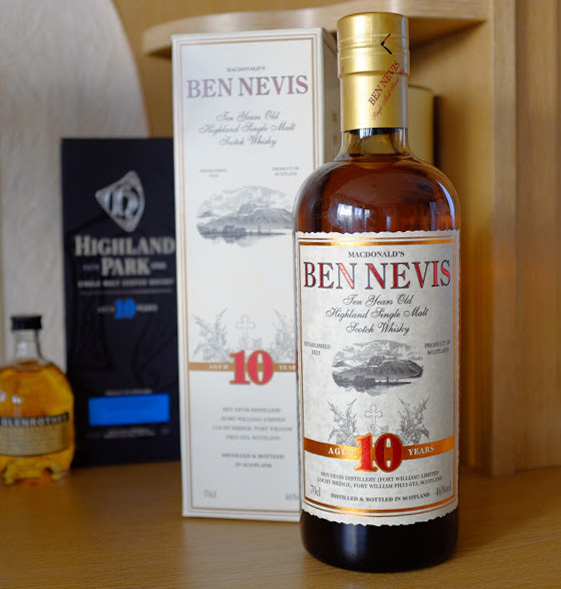 Rich, bold and complex at what once deemed as the minimal bottling age by whisky producers.